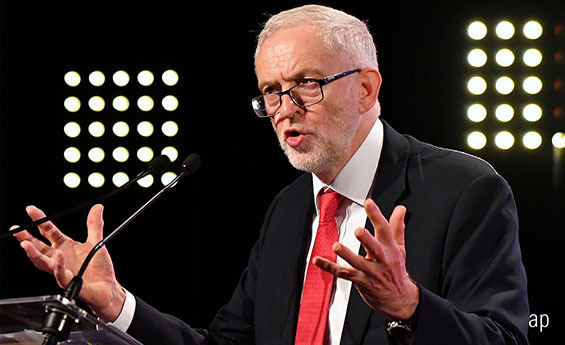 A Jeremy Corbyn Government is a worry for markets, but might not be as bad for equity and bond holders as some believe, according to fund managers. Sentiment towards the UK is currently weighed on by Brexit uncertainty. But some have suggested the fall of Theresa May’s Conservative Government and potential replacement with Labour leader Corbyn’s socialist agenda could pose a far greater threat to UK assets. Corbyn has repeatedly threatened many industries with re-nationalisation, including the postal service, utilities, transport and others. Polls show the public increasingly approving of this plan, with some investors now shunning these spaces as a result. Benstead thinks investors should be thinking about the potential for a change in Government more than they are Brexit. The real impact of the latter, he notes, could take decades to be felt, whereas “nationalisation of utilities, say, could be around the corner”. And it will have big implications for bond holders, of course, he adds, though not all negative. He points to the example of Railtrack, the former British Rail which was privatised by John Major in 1996 at an offer price of 360p. Having peaked in November 1998 at £17.68, the firm was finally re-nationalised by Tony Blair in 2002. After taking legal action, remaining shareholders received just 262p back in compensation. “Equity got wiped out in Railtrack,” says Benstead, “but the bonds ended up being Government guaranteed. Benstead does admit he’s sold every non-operating company water bond his portfolio owns, but, after plenty of research, he reckons bonds in operating companies may not be negatively affected. It does get quite complicated with bonds, though, says Annabel Rudebeck, head of non-US credit at Western Asset Management. RBS (RBS), for example, has been outlined for a potential nationalisation to make it a bank for social good. “That could make RBS into a quasi-sovereign trading quite tight, or it could make it into a very unprofitable high-yield offering trading very wide. The same thing for the water sector,” Rudebeck says. So, it’s very difficult to weigh up for fixed income managers. On the equities side, too, the view is fairly sanguine. Nick Langley, manager of the Legg Mason IF RARE Global Infrastructure fund, says after his team analysed Corbyn’s impact early this year the fund bought exposure into the UK utilities sector, particularly water companies. His fund currently holds a top five position in United Utilities (UU. ), which provides water services to the north-west of England, and a smaller position in Pennon Group (PNN), which owns South West Water. Its top 10 also includes energy firm SSE (SSE). Langley thinks the Government of the time would struggle to get away with paying a 0% premium for any business it nationalises. “More likely, you’ve got a 10-15% premium to the asset base,” he claims. Further, while the listed players tend to trade at premiums of 5-20%, the unlisted market, which are generally backed by sovereign wealth funds, usually trades at around 25-35%. Many water firms have been aggressive in their response to Labour’s rhetoric and would likely take the Government to court if the premium was seen as too small. Is a Labour Government Likely Before 2022? That said, Langley says he and his team have also spoken to a number of Labour politicians and the response he’s received is that nationalisation is actually quite a long way down their priority list. And, of course, there’s the fact that the next general election is not scheduled until 2022, meaning nationalisation probably won’t happen until around 2023-2025. “Our view is there’ll be a lot of noise around it and it plays well with their constituent base, but ultimately financial sense will prevail and it’s unlikely to be actually implemented,” says Langley. True, there is the possibility of an early general election being called, with many Conservative MPs unhappy with the course Prime Minister Theresa May is taking on Brexit. But are they really going to risk the chance of Corbyn getting in to Number 10? “They’d be mad to, but it’s weird world," says Benstead. "‘A week’s a long time in politics’, ‘events, dear boy, events’, there’s so many quotes that could throw that out. Unlike Benstead, Rudebeck is more worried about the possibility of a no-deal Brexit than a Corbyn Government right now. “Jeremy Corbyn is a very awkward noise to have in the background, but the possibility of him getting in is not as obvious as it might seem in the press at the moment,” she says.